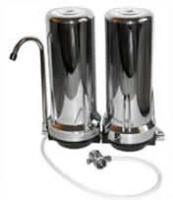 Filter #1: Standard filter includes KDF55 and 5-micron Acid Washed Coconut Shell Carbon removes or reduces chlorine, sediment, algae, molds, scale, bad taste, odors and other undesirable contaminants. Lasts 10,000 gallons. Filter #2: Fluoride filter includes activated alumina. Lasts roughly one year and removes up to 1.5 ppm for up to 500 gallons. Contents: 5-micron cartridge contains a sediment pad layer prefilter, CuZn's patented FilterFoam KDF filtration media and acid-washed, dedusted coconut shell carbon. The fluoride cartridge contains activated alumina. Flow Rate: 1 gpm under-counter; gpm countertop. Dimensions: 11.75" tall x 9" diameter 4.5" deep for countertop; 13.5" tall x 6" deep x 11" wide for under-counter. Warranty: 5 years pro-rated on housing, 1 year on cartridge for countertop; 5 years pro-rated on housing only for under-counter.